Trees are one of the few natural things that give us the feeling of Mother Nature. Trees provide us much needed green life that helps improve our health in this era of excessive urbanization. Chip Off The Block Greenslopes includes tree removal, tree lopping, stump grinding and stump removal anytime you need it. Our team of expert tree loppers at Chip Off the Block Greenslopes will work with you to find the that best suits your landscape. If want tree removal services or other tree services, Chip Off The Block Tree Lopping Greenslopes is the perfect company to call. We offer a wide range of service, and you can be sure we are not only after profit we have your best interest at heart. Our tree loppers are specially trained to focus on the health of your landscape. Dial 1800653256 to get across to know more about our services and tree removal cost. When trees grow old and large, they may become a nuisance to you, your loved ones and your landscape. Leaving large dead trees or infected trees is like writing a letter to termite infestation. Chip Off The Block Tree Removal Greenslopes will help you with tree removal in a way that it doesn't affect you, your property or your family. Our tree loppers and arborist are equipped with the best equipment to removed your old or diseased tree efficiently. We have a very high standard of reputation and professionalism that will ensure that your trees are removed entirely and isolated during removal in a way that no residue remains on the ground. Chip Off the Block Tree Removal Greenslopes is ready to remove your tree with the best safety precautions. Just dial 1800653256 to know about our tree services and inquire about our tree removal cost. Why Opt to Stump Removal and Stump Grinding Service? Having a stump on your property or landscape should not disturb other landscaping plans and the health of other plants around. Termites and Maggots infestation on the stump could result in having a rotting stump left unremoved, and this can cause other pest infestation and damage your garden. At Chip Off The Block Tree Lopping Greenslopes our trained tree loppers use state of the art facilities to remove unwanted stumps and keep your garden safe and healthy. Call or email us! Talk to our team of Tree Lopping Greenslopes experts today! ​We are available 24/7 to serve you. Do I need to remove my tree? Getting rid of or doing remedial maintenance on a tree isn’t always straight forward, there are an number of things you may need to consider when you think you might need a tree to be looked at by our team. You might have a tree that is diseased or dead which may pose a hazard to your family or nearby buildings on your property. These trees can also be attractive to pests like insects and termites which can in turn cause even more issues for your home. Tree roots, especially from pest species can get underneath building structures, into pool and pipes which can also cause massive damage and big expenses. Over hanging branches can fall on roofs, powerlines and fences. The weight on heavy branches can sometimes cause trees to split clean in half. Preventative maintenance of these trees is required on a regular basis. 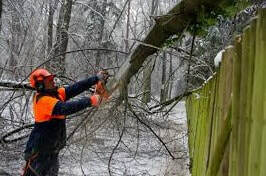 You might have a tree that is interfering with a new extension, shed or fence. The tree cutting specialists at Chip Off The Old Block take the time to listen to you, your requirements and your budget to get you the best possible outcome and the best possible price. So call us now, email us or use our online quote form. If we don’t pick up the phone straight away chances are we are up a tree doing monkey business but we promise we will call you back. Experience the best tree lopping, stump grinding and all round tree services of Chip Of The Old Block. We Service Brisbane, Gold Coast, Ipswich and Logan and can come to you.